The City Crafter Challenge this week is 'Dress Up a Jar'. Just the excuse I needed to organise my vintage button collection. Now they're all in a dressed up jar! Just need to organise the rest of my button collection now. 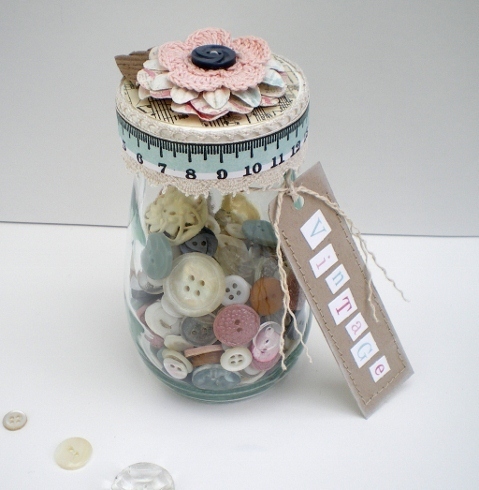 Lovely jar Vicky and just perfect for all those lovely vintage buttons! Might have to check this challenge out, I have a number of jars just waiting to be used! Wonderful job! And so useful! Love it! Beautifully decorated and you'll have to keep it topped up with lots of pretty buttons - it wouldn't look the same without them. WOW!!! This is fabulous and lovely, thanks for sharing your beautiful work with us at CCCB! This is so pretty and feminine, love it! 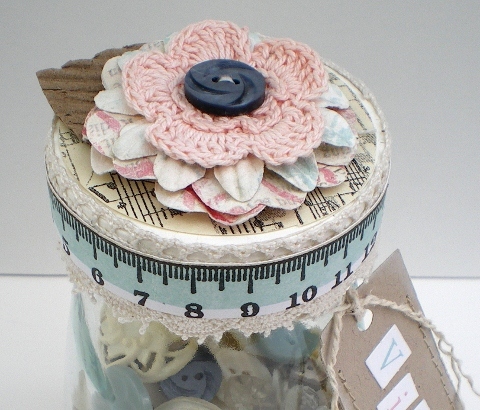 Gorgeous jar, love the buttons and the lovely colours. This is so darn cute.. I just love it.. Thanks so much for playing along with us at CCCB! This is so pretty Vicky, I love your vintage style. Good luck with the rest of your organising! Perfectly LOVELY in EVERY way! LOVE this "SEW" much! Thank you for joining us at CCCB this week! Wow... Beautiful. Congratulations on your win at CCCB.